Here are some pictures from the introduction of the game... They probably make a reference to the legend of "A Link to the Past". 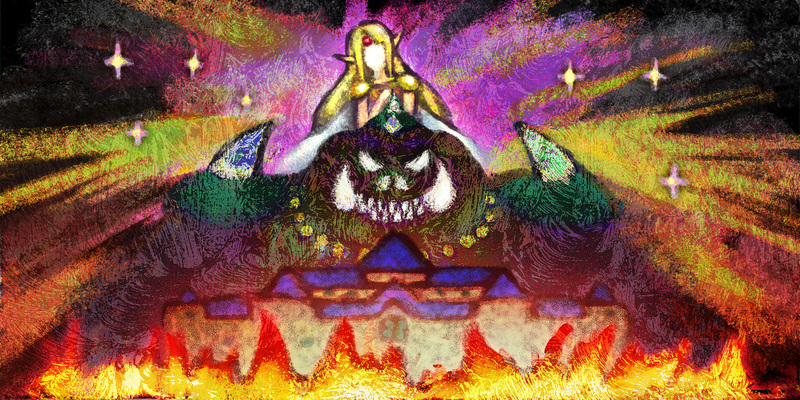 But just as Ganon had the kingdom in his evil clutches... a legendary hero answered the call of Hyrule's princess. And this here, wielding the Master Sword, took up a quest to challenge Ganon's might. He joined with the descendants of the Seven Sages to seal the Demon King in darkness. 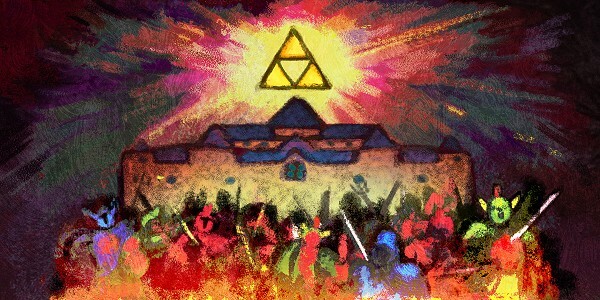 The Triforce was divided into three - its tempting power out of any one person's reach. This gift from the gods, Hyrule's greatest treasure, will grant the wish of any mortal who touches it. The Triforce once stoked greed in the hearts of men. A legendary war was fought to keep it out of evil hands. To end the war for the Triforce, the royal family decided to hide it in the Sacred Realm. 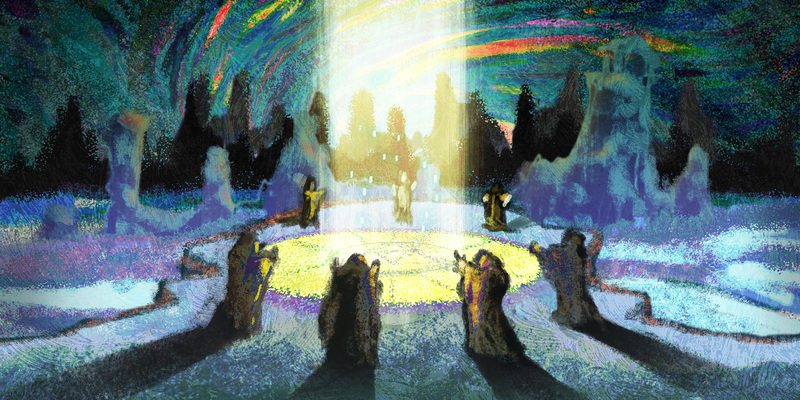 They summoned the Seven Sages of legend, who used their power to seal the Triforce away. The Demon King Ganon was once just a thief - until the man broke into the Sacred Realm. There he stole the Triforce and transformed himself. Then he took his evil campaign back to Hyrule. 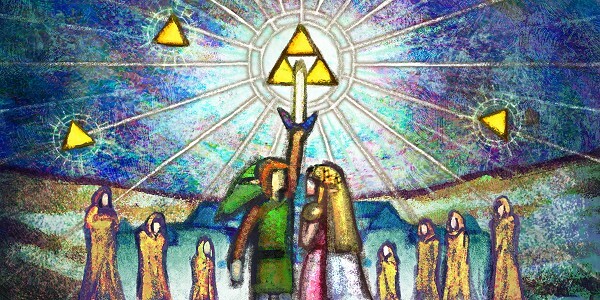 A hero of legend arose from humble beginnings, awoken to his purpose by a princess of Hyrule. With the Master Sword, the blade of evil's bane, he sought the descendants of the Seven Sages. Together they defeated the Demon King Ganon - and sealed him away in darkness. The Triforce was split into three pieces, separated forever. One piece remains with the royal family. Another piece has fallen into the hands of Ganon, sealed away with him. The third piece of the Triforce has vanished, though legend says it is hidden in the spirit of a true hero. It slumbers now somewhere in Hyrule - waiting for the time when the world needs a new hero. 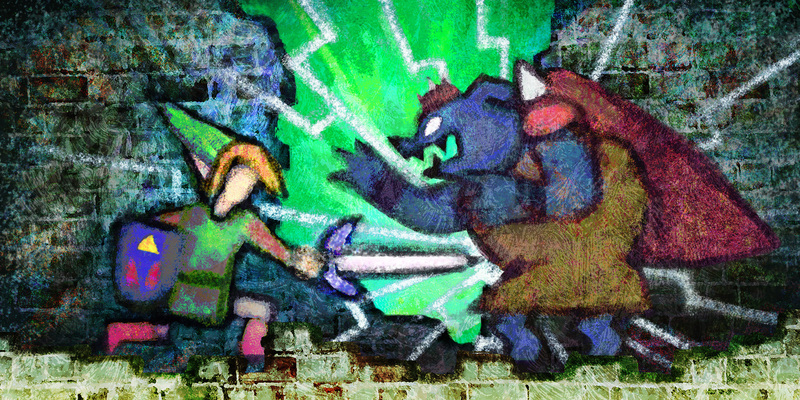 In a interview given to cnet, Eiji Aonuma said that the main inspiration to turn Link into a painting and have him walk into walls comes from the Ocarina of Time game. It is when remembering the battle against Ganondorf, who was going from a painting to another, that the producer had the idea to adapt this concept to the hero of the series. This new ability allows Link to travel between two worlds, reach some places inside and outside dungeons, and to solve puzzles.